Ross Castle sits on the edge of Killarney's lower lake and was built by O' Donoghue Mór in the 15th Century. 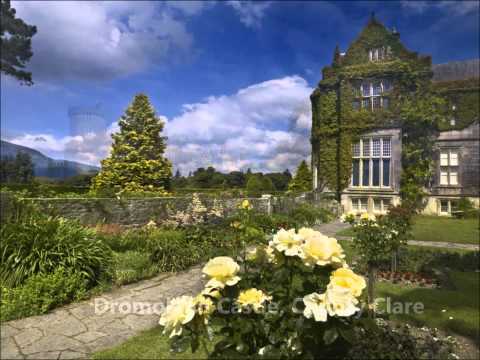 The Castle came into the hands of the Brownes who became the Earls of Kenmare and owned an extensive portion of the lands that are now part of Killarney National Park. Legend has it that O' Donoghue still exists in a deep slumber under the waters of Lough Leane. On the first morning of May every seven years he rises from the lake on his magnificent white horse and circles the lake. Anyone catching a glimpse of him is said to be assured of good fortune for the rest of their lives. The large rock at the entrance to the bay is known as O' Donoghue's prison. Ross Castle was the last stronghold in Munster to hold out against Cromwell. It was eventually taken by General Ludlow in 1652. It is surrounded by a fortified bawn, its curtain walls defended by circular flanking towers, two of which remain. Much of the bawn was removed by the time the Barrack building was added on the south side of the castle sometime in the middle of the 18th Century. The castle contains 16th and 17th century oak furniture. Guided tours are available and take approximately 40 minutes, during the summer months the site can get very busy and visitors may experience delays. Access for people with disabilities to the ground floor, only by prior arrangement. Our Romantic Self Drive Tours of Ireland!